As per the D.O.C.G. regulations, Brunello di Montalcino Riserva must be aged for a total of five years as opposed to four required for the regular Brunello. The Brunello Riserva Poggio Antico is only produced in exceptional vintages. In those years the grapes from the oldest and lowest altitude vineyard are processed and aged separately. The Poggio Antico Riserva spends three and a half years in wood; the first year of aging takes place in 500-liter French tonneaux while the remaining aging is in new Slavonian oak barrels. The wine is then bottle aged for one and a half years before release to complete the mandatory five years of total aging. The result is a mature, round and complex wine. 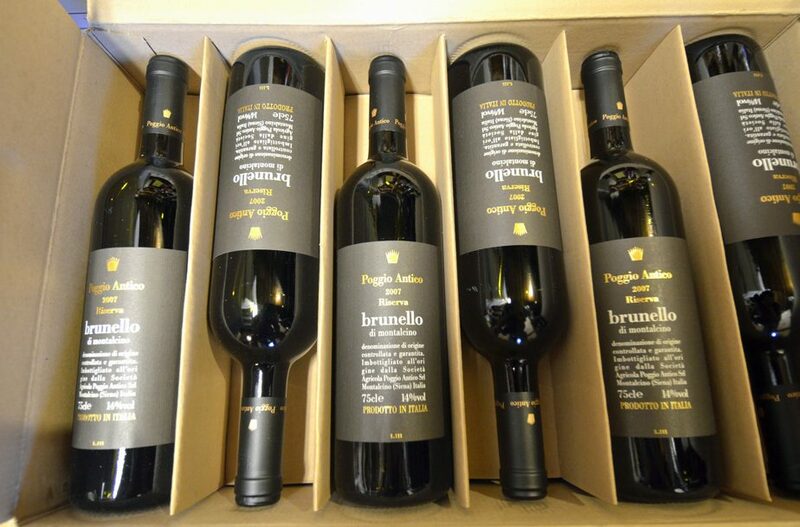 The rather limited production of Brunello Riserva usually averages 18,000 bottles. Due to its characteristics, it is a wine for which further bottle aging is encouraged. The Riserva is an intense ruby red, with garnet hues. Its bouquet is usually evolved and austere, with hints of wild berries, leather, and roasted coffee. In the mouth it has a fully developed rich structure, and is very elegant and smooth thanks to its rich tannins. It is extremely well balanced and rounded, with a persistent silky finish. To date Riserva vintages from Poggio Antico include: 1985, 1988, 1990, 1993, 1995, 1997, 1999, 2000, 2001 and 2003. Poggio Antico also produces a limited number of Magnums (1,500 ml) of Brunello di Montalcino Riserva. Double Magnums (3,000 ml) are also released. Both these special formats are packaged in beautiful wooden cases, which are also available – upon request – for the regular bottle format (750 ml.). James Suckling: 94 points. Wonderful richness of fruit with a balance of plums and berries. Full and round with ripe tannins and an undertone of vanilla and cedar. Drink now or hold. Here’s a home run from one of the best producers in Montalcino. With sun drenched, sea-facing vineyards (this is one of the only spots where you can see the shimmering Mediterranean from Montalcino), this dense riserva doles out lingering flavors of spice, cherry, leather and tobacco. The acidity is perfectly balanced against the wine’s soft fruit. Score: 94. —Monica Larner, May 01, 2013. 94 points. A beautifully layered, expressive wine, Poggio Antico’s 2007 Brunello di Montalcino Riserva caresses the palate with exceptional elegance, finesse and total class. Sage, rosemary, licorice and tobacco all flesh out as this radiant Brunello shows off its considerable personality. Hints of dried rose petals add intrigue on the finish. This is without question one of the very best 2007 Riservas readers will come across. Anticipated maturity: 2015-2027. 94 points. A beautifully layered, expressive wine, Poggio Antico’s 2007 Brunello di Montalcino Riserva caresses the palate with exceptional elegance, finesse and total class. Sage, rosemary, licorice and tobacco all flesh out as this radiant Brunello shows off its considerable personality. Hints of dried rose petals add intrigue on the finish. This is without question one of the very best 2007 Riservas readers will come across. 92(+?) Points | Stephen Tanzer’s IWC – July/August 2013(14% alcohol): Bright ruby-red. Spicy aromas and flavors of red cherry, plum, menthol and flowers. Denser, fleshier and sweeter than the 2008 classico bottling, with strong saline minerality contributing to an impression of chewy extract. The rising finish boasts superb thrust and mounting tannins. Still, as impressive as this Brunello is, it seems a little raw today and shows more than a trace of alcoholic warmth. Lay it down for a good five or six years and watch it blossom.